Magnetic nanoparticles could be used to track neural stem cells after a transplant in order to monitor how the cells heal spinal injuries, say UK scientists. Neural stem cells are a promising treatment for repairing spinal cord injuries as they have the ability to generate tissue, but there is no effective way of monitoring the cells for long periods of time after transplantation. Nguyen TK Thanh at the Davy Faraday Research Laboratory, University College London and the Royal Institution, and colleagues, believe they have the answer. They have developed hollow biocompatible cobalt-platinum nanoparticles and attached them to the stem cells. 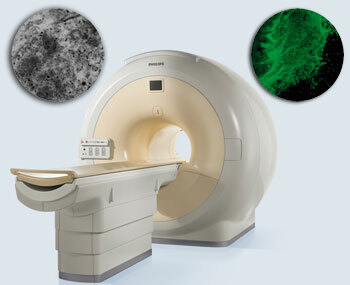 The nanoparticles are stable for months and have a high magnetic moment – tendency to align with a magnetic field – so that low concentrations can be detected using magnetic resonance imaging (MRI). The team labelled stem cells with their nanoparticles, injected them into spinal cord slices and took images of their progress over time. They found that low numbers of the nanoparticle-loaded stem cells could still be detected two weeks after transplantation. ‘The new method demonstrates the feasibility of reliable, noninvasive MRI imaging of nanoparticle-labelled cells,’ says Thanh. Thanh hopes that her stem cell tracking method will be used during stem cell replacement therapy for many central nervous system diseases. Her team is working towards developing nanoparticles that can be used to diagnose and treat these diseases.